This review has been printed in the September 2018 issue of Chess Life. A penultimate (and unedited) version of the review is reproduced here. Minor differences may exist between this and the printed version. My thanks to the good folks at Chess Life for allowing me to do so. Kislik, Erik. Applying Logic in Chess. London: Gambit Publications, 2018. ISBN 978-1911465249. PB 320pp. Looking back at recent month’s columns, I have noticed a rather evident bias towards ‘serious’ titles and topics, often devoted to calculation, solving, or improvement. Such an emphasis is not too surprising – after all, research is me-search, as the old saying goes – but it also completely neglects huge swaths of chess literature. Last month’s column was a first step in redressing this bias, and I hope to broaden my scope in the months to come. So why, then, am I reviewing another serious tome here? Let me put it simply. IM Erik Kislik’s Applying Logic in Chess is one of the most interesting titles to appear in recent years, but it is also one of the most maddening. Rarely have I been at once so fascinated and utterly frustrated by one and the same book. Surely something that can prompt such a visceral reaction deserves discussion. Erik Kislik is an American International Master currently living in Hungary. He works as a trainer for IMs and GMs like Spanish Super-GM Paco Vallejo, and he bills himself as “an expert in computer chess and one of the most in-demand chess trainers on ICC [chessclub.com].” Applying Logic in Chess is his first book, and it is a vastly ambitious effort, offering readers a comprehensive, no-holds-barred rendering of his ideas about chess improvement and training. Part of the difficulty in reviewing Kislik’s book is a direct result of this ambition. A quick glance at the Table of Contents reveals the vast terrain he tries to cover over the course of the text, and it’s very hard to synthesize his ideas succinctly. One hand-hold, as it were, can be carved through a consideration of the meaning of the book’s title, and an exploration of what Kislik means by logic. Consider this example, taken from Chapter 7 (“Is Chess a Logical Game?”) of Applying Logic in Chess. Kislik employs it to show how the employment of “simple logic in complex positions” can allow us to penetrate “right to the heart of a position.” (178) The text and notes are his. 1.Be4!! White gives up a bishop, but uses the tempo effectively to trade off a bunch of pawns. 1. 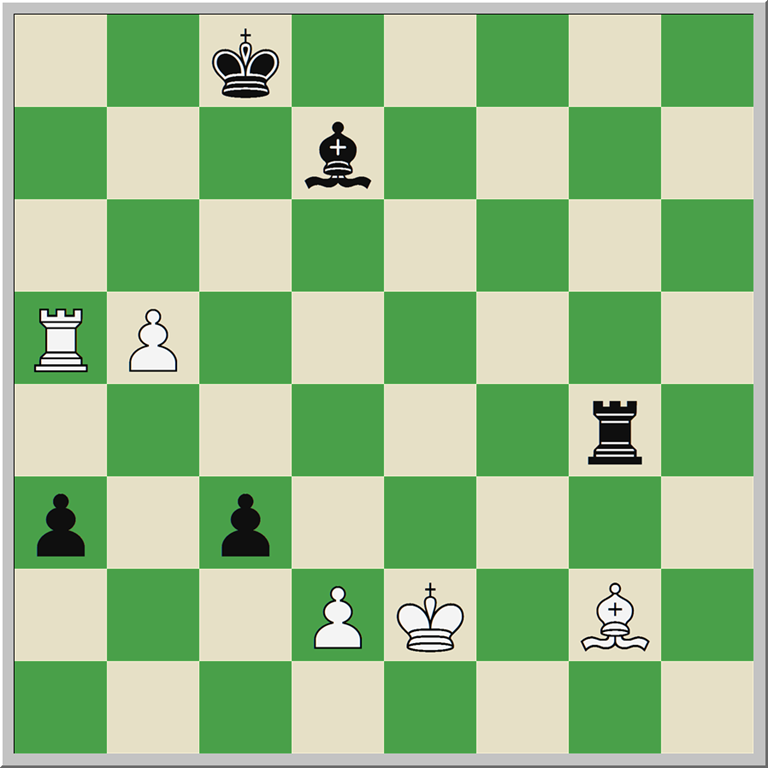 …Rxe4+ 2.Kd3 White hits the black rook with tempo and attempts to capture the two remaining pawns as quickly as possible. 2. …Ra4! After 2. …Rc4, 3.dxc3 draws. 3.Rxa4 Bxb5+ 4.Rc4+! This distracts the bishop. 4.Kxc3?? Bxa4 leaves the white king cut off because it cannot come to c2 to get in front of the a-pawn. 4. …Bxc4+ If 4. …Kb7 5.Kxc3 Bxc4 6.Kc2. 5.Kxc3 Kd7 After 5. …a2 6.Kb2 White draws by giving up the d-pawn. 6.Kc2 Kc6 6. …Ba2 7.Kc3 , intending Kb4, is an important point. 7.Kb1 White gives up the d-pawn to achieve a simple theoretically drawn position in which Black can never make progress if White just keeps the king in the corner behind the a-pawn. What is the nature of this ‘logic behind the solution?’ Clearly, and despite Kislik’s talk of ‘first principles’ (15) and informal fallacies (11, 78, 103), we are not dealing with any sort of formal logical system that might undergird all of our thinking. Here we must also note how misleading the book’s cover is. There is nothing in the text that resembles a flowchart for thought. Here is where Kislik’s book absolutely shines. Applying Logic in Chess is filled to the brim with advice for improvement, and I cannot begin to hope to discuss it all here. What follows is a paltry, partial list of some of the highlights. Following Larry Kaufman’s work, Kislik argues (14-26) that we need to more precisely value the pieces. The familiar 1-3-3-5-10 scale is replaced with 1 (pawn), 3.45 (knight), 3.55 (bishop), 5.25 (rook) and 10 (queen). The bishop pair is worth half a pawn, while a tempo is equivalent to about a quarter of a pawn. Training should be divided into temporary and permanent tasks. It should be ‘task-oriented’ instead of ‘result- or ego-oriented.’ This could be read alongside Aagaard’s discussion of growth mindsets. Kislik differentiates between six facets of chess strength (chapter 4): concrete knowledge, pattern recognition, calculation, candidate moves, positional understanding, and logic. He offers specific training advice for each element. One of the most important elements in Kislik’s vision for improvement is the accumulation of ‘chess culture’ through the study of master games. This can be broken down into three parts. (a) Players should study every game from World Championship matches after 1930. (b) They should scan through relevant games each week in TWIC. (c) They should especially study annotated games collections by the players themselves. There is an extensive discussion of, and heavy emphasis on, the proper use of engines and chess databases in analysis and opening study. (Chapters 8-10) Kislik’s expertise is evident in these pages, and for me, this is perhaps the best part of the book. Chapter 10, devoted to ‘metagame strategy,’ is immensely thoughtful. Here he treats questions related to opening choice, how to prepare and maintain a repertoire, and his methods for building opening files. This list barely scratches the surface of what appears in Applying Logic in Chess. Hardly a page is turned without readers encountering something thought-provoking. Still, we might sum it up as follows: work very, very hard; use computers to study; and use our cultivated chess ‘logic’ to play quick, solid moves. Worse, when he is not crowing about the novelty of his ideas, Kislik tends to set up straw men to demolish. The first pages of the chapter on logic (ch 7) are a prime example of this tendency. He presents ‘common arguments’ and ‘common beliefs’ in order to punch them down, but the ‘arguments’ (note – they are not arguments but bald assertions) are so asinine that they barely merit attention. Phrases like “I’ve never seen anyone write about X” and “I’ve never met anyone who did Y” appear throughout the text. It’s pure bluster, and the ideas in the book are more than strong enough to stand without such puffery. In the end I think Applying Logic in Chess is an excellent book, but one that should have gone through (at least) another round of developmental editing. I love the fact that there are multi-page stretches unsullied by diagrams or analysis – there is plenty of analysis too, of course – and I cannot think of another book with so many pearls of wisdom strewn, if somewhat randomly, through its pages. It is frustrating that that you have to do a lot of sifting to find them, but rest assured that the process is entirely worthwhile. Nota Bene: In the interest of full disclosure, I took a one-time lesson with Erik Kislik in 2015, mainly focused on his understanding of best practices for ChessBase and engine use. I have had no other substantial contact with him since then. Pasternak, Boris. “Во всем мне хочется дойти…” translator unknown. Taken from Dvoretsky, Mark. Secrets of Chess Training. London: Batsford, 2001. iv. This entry was posted in Instructional, Philosophy, Studies and tagged Appying Logic in Chess, Erik Kislik, Gambit Publications on September 1, 2018 by fullcityplus.